Gagosian is pleased to present new works by Shio Kusaka. This is her first solo exhibition with the gallery and her first in Italy. While Kusaka’s exhibitions typically feature a combination of abstraction and representation, this is the first to focus exclusively on her abstract work. The ceramics, variations on the form of the vase, are drawn and etched with continuous, geodesic lines—a process that is simultaneously systematic and intuitive. Minimalist repetitions stretch across the round volumes, echoing the grids of Agnes Martin, or the instruction-based wall drawings of Sol LeWitt, which also embrace the irregularities of the hand-drawn line, creating sinuous, oscillating terrains. Throughout her oeuvre, Kusaka has infused the subtleties of the ceramic medium with playful details and subject matter, from basketballs and fruit, to dinosaurs, raindrops, and wood grain. Her geometric works, however, offer a more direct view of her technical mastery, as she discovers the infinite permutations that can result from adhering to a single process and approach. In previous abstract works, Kusaka often “ended” a line or grid pattern once it became distorted by the curvature of the pot, producing fragmented, interlocking patterns that appear as overlapping drawings, contradicting the three-dimensional volume. In these new works, however, she takes an almost topographic approach, expanding the responsive tactility necessary for wheel-throwing by carving, or drawing, intricate lines along the surfaces of each pot. Allowing the three-dimensionality of each vessel to determine the concentric curves of the lines, Kusaka unites the primary creative acts of drawing and sculpting. While some lines appear straight and parallel, others resemble waveforms and schematic topographies. 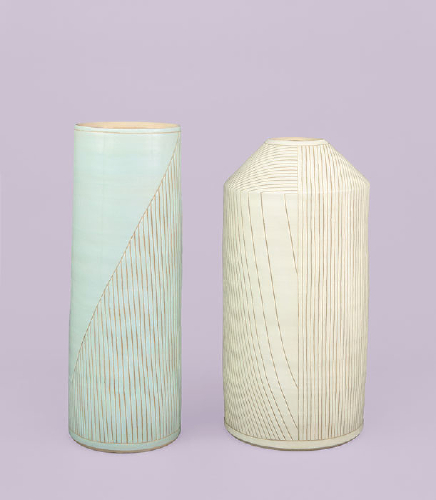 Her largest vessels to date, displayed on a long, curved wooden pedestal, are glazed in cool, muted tones, from pale blue, pink, or yellow to a tranquil off-white, and the thick liquid stops above the base of each: a necessary precaution when kiln-firing, and a subtle reminder of the alchemical transformations inherent to the medium. In a selection of smaller pots, Kusaka repeats many of the etched patterns as pencil drawings on a white ground, creating more intimate, sketch-like echoes of the large works. She thus restates the process-based techniques of the Minimalists, while also underscoring the infinite potential of form itself: from large to small, liquid to solid, two to three dimensions.